In 1966, Vans shoes opened its first store in the U.S. Today, they sell shoes to board sport enthusiasts around the world. In fact, the first multi-colored Vans shoes were made for sponsored surfers and skateboarders Stacy Peralta and Tony Alva, both members of the original Dogtown and Z-boys. These days, it is not uncommon to see surfers sporting Vans shoes, and there are plenty of professional surfers sponsored by this successful company. Vans carries a number of styles and models, and one of my new favorites is the Rata Plus, which is part of their newer line of surf shoes. Not only are these shoes super simple, they are also extremely light and very practical. 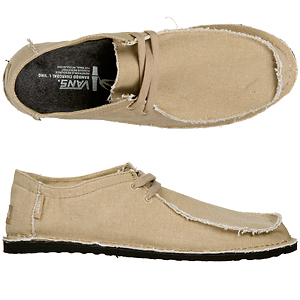 I wear them to school and the beach, and they are just as good if not better than sandals. These shoes run about $45 a pair and are well worth the cost. On top of all of the comfort and good looks, these surf shoes are entirely eco-friendly, which helps in the preservation of our earth and in the beautification of our precious ocean. So, you can feel good about wearing them.